Enhance your Bianco Smile teeth whitening experience with our bamboo charcoal toothbrushes embedded with charcoal infused bristles. These toothbrushes are made with premium medium-bristled bamboo which provides a gentle brush for your teeth and gums leaving your mouth feeling extra clean and healthy. A natural deodoriser for bad breath. Made from 100% organic materials. Absorbs bad chemicals from your tap water. 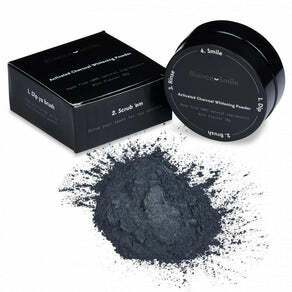 1) Dip: Dip your Bamboo Charcoal Toothbrush in your Activated Charcoal Powder, Charcoal Toothpaste or even your regular toothpaste for a brighter smile. 2) Scrub: Scrub your teeth, covering all surface area of your upper and lower teeth.